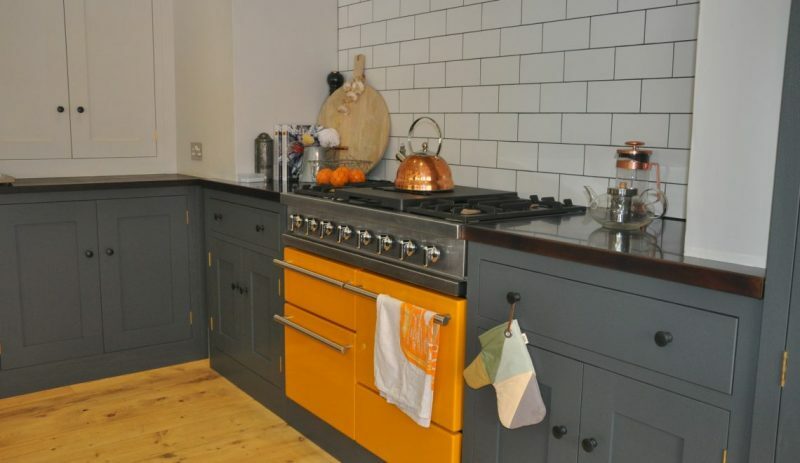 In most family homes the kitchen is the go-to hub, a bustling, high traffic area which needs to function efficiently and reflect the style and character of its occupants. Kitchens are often the first space that people look to renovate and here I give you my top 5 eco tips on how to make your kitchen as green and healthy as possible. I think the saying “if you buy cheap, you buy twice” applies nowhere better than the kitchen. In a busy, family kitchen imagine the number of times the tap is turned on, the cutlery drawer pulled out, the fridge opened – if the mechanisms for these things are not robust then they are sure to fail with constant use. So, in terms of kitchen units and appliances focus on durability because a large part of eco-renovation is about ensuring interiors stand the test of time. When you’re sourcing kitchen units check what hinges are being used because they can affect the performance and longevity of the cabinet more than the choice of wood or finish. British or German made hinges are best (Armac Martin, Grass and Blum are all excellent quality) but avoid Chinese or Indian brands. Also, think about the ability to recondition fittings when they’ve taken a few knocks – painted cabinets are great because they can be easily touched-up and refreshed with a lick of paint. Specialist decorators, such as Nicky Jones, can transform a tired, dated looking kitchen without ripping out a single unit. Photo by Sustainable Kitchens – units built using FSC wood, plywood classed as E1 and hinges made by British firm Armac Martin. I think a lot of fitted kitchens can be a bit bland and samey. To avoid this and to make an individual, eco statement incorporate something that’s reclaimed or antique. Whether it’s a set of old brass taps; an antique chandelier hanging over the island; a set of open shelves made from scaffold planks and copper pipes; or a French armoire to house your plates and glasses. An idea I’ve had for our new kitchen is to buy some of these mahogany cabinet fronts from Retrouvius and use them as the doors on an overhead wall unit. It’s not an exciting topic, I know, but one of the hidden costs of making our homes more energy efficient is poor air quality and the kitchen is the place where it’s essential to think about ventilation. The April edition of Which? magazine has results from air quality tests performed on 3 houses from different periods. In all 3 houses they found worryingly high levels of volatile organic compounds (VOCs) and high particulate and carbon dioxide concentrations in the kitchen spaces. VOCs and particulates can cause allergies and lung irritation whilst high levels of CO2 leads to dizziness and headaches. If you’re building a new kitchen extension then it’s definitely worth thinking about mechanical ventilation with heat recovery (MVHR). The Green Building Store are highly regarded for their MVHR design service and I’m using them to install the ventilation system in our low energy extension. If you’re not doing such a big overhaul then leave a generous budget for an extractor fan with a powerful motor, ideally externally vented. If you’re really worried about indoor allergens or have asthma sufferers in the house then you should inquire about the formaldehyde levels in your units. Many kitchen carcasses are made from plywood but by ensuring that they’re classed as E1 then they’ll have the lowest levels of formaldehyde and won’t pollute your kitchen space. Also, use low VOC paints for cabinetry (see my 22nd November post on Eco Paints Demystified) and check out Sustainable Kitchens who build beautiful, eco friendly kitchens from sustainably sourced wood and plywood. Devol also have their Sebastian Cox range which is made entirely from British sourced woods. With the number of appliances in kitchens increasing and the ever rising cost of electricity, choosing energy efficient appliances is both good for the planet and for your bank balance. Appliances are rated from A+++ (most efficient) to D (least). Which? undertake energy assessments of appliances and label the most efficient ones as Energy Savers. The most important appliances to ensure are energy efficient are fridges, freezers and ovens. Fridges and freezers are switched on all the time and use about 20% of the electricity in an average house. Since 2012 all fridges and freezers must have an energy rating of at least A+ but the difference in energy consumption between an A+ and an A+++ fridge can amount to £190 over its lifetime. It’s also possible to buy fridges with an energy saving holiday mode. Similarly, an A+++ electric oven will use 60% less energy than a B rated one so it really does make economic sense to buy the more energy efficient model even if it is a bit more expensive. A final note on these energy guzzling appliances is don’t oversize them because larger appliances consume significantly more energy than smaller ones and in the case of ovens take considerably longer to heat up. The more intuitive you make the recycling in your kitchen the more you’ll do it. There are lots of ingenious ways of incorporating recycling bins into kitchen units. Think about what your local authority requires in terms of separation of materials and incorporate the appropriate divisions into your bins. To encourage you to recycle more, make your recycling bin larger and a little more accessible than your landfill bin and label both bins clearly. In terms of food waste, locate this close to your prep area and make sure that everything can be swept into it easily. If you’re able to make compost then think about having two separate divisions for cooked and uncooked food. Also make sure your food waste container has a close fitting lid to minimise smells.